FILE - Fish swim over a patch of bleached coral in Hawaii's Kaneohe Bay off the island of Oahu. Hawaii, Oct. 26, 2015. Hawaii officials have proposed steps to fight coral bleaching that's threatening the state's reefs, including new marine protected areas, limits on fishing and controls on runoff pollution. It's a serious concern for the health of the ocean, because coral reefs provide habitat for fish and other marine life, scientists say. Severe or concurrent years of bleaching can kill coral reefs, as has been documented over the past two years in oceans around the world. Scientists expect a third year of bleaching to last through the end of 2016. Anderson said the state came up with the proposals after surveying over 80 scientists around the world about what steps were most effective at helping coral reefs. 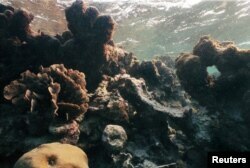 FILE - An undated photo shows the effect of bleaching on coral off Caye Caulker, Belize. Phil Fernandez, president of the Hawaii Fishermen's Alliance for Conservation and Tradition, said he looked forward to working with Anderson and the state on the proposals. The no-take zones may be problematic, depending on where they would be, he said, but his group is open to discussing them. As for potential catch limits on parrotfish, a popular reef fish, he said the species needs to be managed, but the question is to what degree and how. Parrotfish help coral by eating algae and preventing it from smothering the reef. "We want the reef to come back. We fish, and the health of fish is completely dependent on habitat. When the habitat is decimated, the fish go away,'' he said. The Nature Conservancy of Hawaii's marine science director said he's excited and encouraged that the state is taking on the issue and that it recognizes it needs to think strategically about coral bleaching. Eric Conklin called the proposals ambitious and noted the state would need to get feedback and input from the community. He said the proposals faced a long road to approval through a public process.